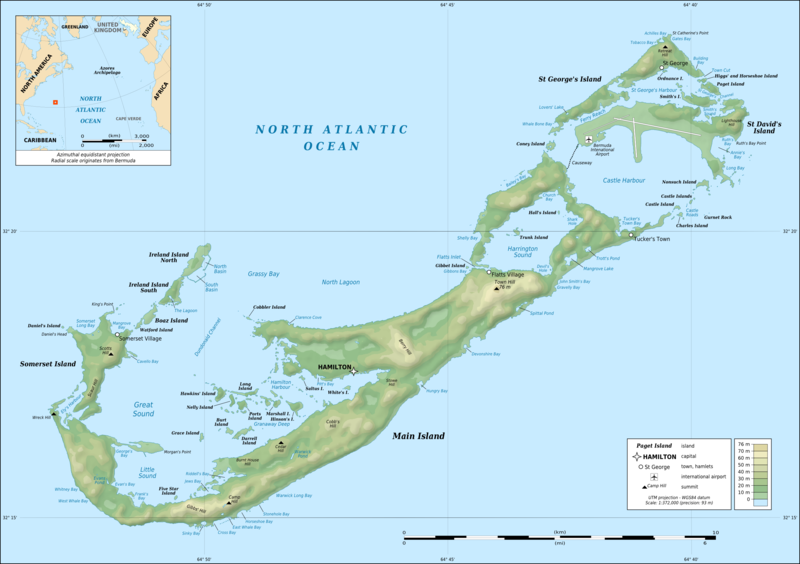 Bermuda, consisting of about 138 islands and islets, is located in the North Atlantic Ocean about 769 miles (1238 km) (669 nautical miles) from New York City. Bermuda has a mild, humid subtropical maritime climate though gales and strong winds are common in winter. The peak hurricane season runs from June 1 to November 30. It is not possible to rent a car on the island; however, visitors can hire scooters for use as private transport, or use public transport. Taxis are available at taxi stands on Front St. in Hamilton, at the major hotels or by phone. All taxis are fitted with a meter and charge $4 for first mile plus $1.40 for each subsequent mile. Prices subject to change. Drivers congregate on Front Street, next to the No. 1 Cruise ship Passenger Terminal. The rides are slow and a pleasant way to take a tour of the city when traffic is light - not recommended when traffic is heavy. The trolley drives past the famous Birdcage, Albouy's Point, City Hall and Bermuda National Gallery, the Anglican Cathedral, the Houses of Parliament, Bermuda Botanical Gardens, Camden House and the Bermuda Underwater Exploration Institute where you'll find the Ocean Discovery Center. Bermuda can be expensive. Because of Bermuda's steep import tax, all goods sold in stores that come from off the island carry a significant markup. When buying groceries or other (non-souvenir) items of that nature, be aware that the best prices are usually away from the more "touristy" areas. For example, one cup of yogurt might cost about $1.60 at a grocery store near hotels; it will cost 25% less at a grocery store further from the tourist attractions, and only 10 cents more than in the United States. When buying these sort of things, go to where the locals go. Located in Warwick Parish, this Par 70, 6100 yard course features ocean views. 18-hole, par 3 executive golf course. Located on the SE edge of Southampton Parrish next to Warwick Parrish. Opened in 1922, this 18-hole course is located near the western end of the island in Warwick and holds the distinction as the oldest course in Bermuda. While Riddell's Bay is a private club, visitors to the island are welcomed. Bermuda is a British overseas territory in the North Atlantic Ocean. Located off the east coast of the United States, its nearest landmass is Cape Hatteras, North Carolina, about 640 miles to the west-northwest. 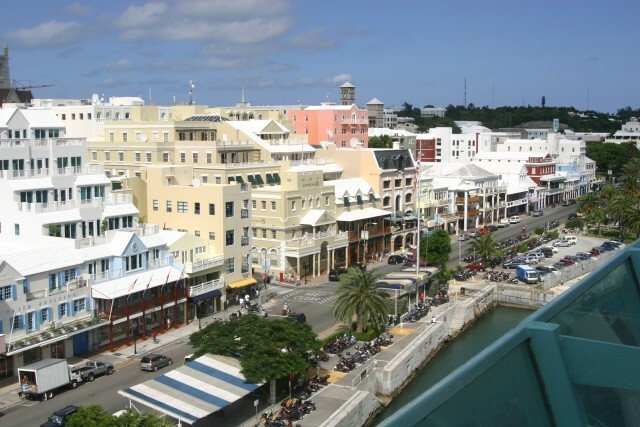 Hamilton is the capital of Bermuda, major financial hub for the islands and features the main port of Bermuda. The city is located on the north side of Hamilton Harbor, and is Bermuda's main port. 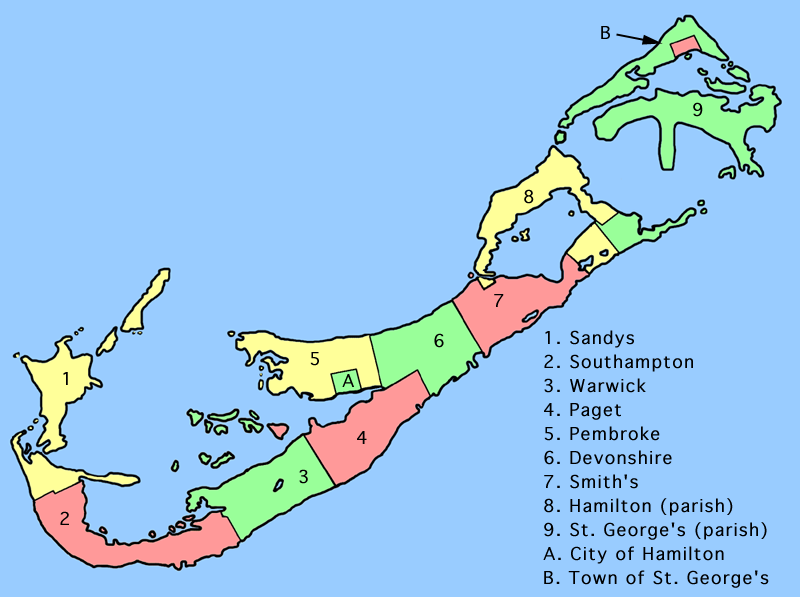 Although there is a parish of the same name, the city of Hamilton is in the parish of Pembroke. The City is named after Sir Henry Hamilton, governor from 1786 to 1793. The parish of Hamilton pre-dates it. Recent years have seen an increase in the size of the cruise ships which visit Bermuda to the point that none can fit through the channel into Hamilton Harbor (in past, only the very largest ocean liners, like the QE2 and the Canberra, were unable to enter, being forced to use an anchorage beyond the Great Sound). Today, most cruise ships must moor at the former Royal Naval Dockyard, their passengers using tenders and ferries to reach Hamilton. Although the island is an associate member of the Caribbean Community (CARICOM), it is not actually in the Caribbean Sea and has a different climate. It is much farther north, but the warm waters of the Gulf Stream help give it a quasi-tropical atmosphere. The islands have ample rainfall but no rivers or freshwater lakes. As a result drinking water is collected on the roofs of all buildings (by law) and in special catchment areas, and stored in tanks under the ground for each home or property. The Hamilton port features 3 berths that can accommodate ships smaller than 700 ft. in length. Pier #1 is the main cruise pier - conveniently located at Front Street. Recent years have seen an increase in the size of cruise ships visiting Bermuda - to the point that none can fit through the channel into Hamilton Harbor (in past, only the very largest ocean liners, like the QE2, were unable to enter the harbor and forced to use an anchorage beyond the Great Sound). Today, most cruise ships must moor at the former Royal Naval Dockyard and tender passengers to reach Hamilton. This park occupies a whole block and was named after the former Queen Victoria. Amenities include a flower garden, entertainment bandstand, benches and restrooms. The botanical garden is located about one mile from the city of Hamilton. Originally opened in 1898 the Bermuda Botanical Gardens feature 36 acres of trees, flowers and shrubs and the Camden House. Open daily from sunrise to sunset. The Camden House is an 18th century Georgian building and the official residence of Bermuda's Premier. The structure is mainly used for government functions. Located at the Bermuda Botanical Gardens. This famous city landmark is on Reid Street. A Howard Post Clock, it was first imported from Boston, Massachusetts, in 1893 by merchant Duncan Doe, a watchmaker and jeweler at 59 Front Street. Point Pleasant Park offers scenic views of the water and is a great place to just chill. The Cathedral of the Most Holy is an Anglican cathedral located on Church Street. The original building was designed in the Old English style by James Cranston of Oxford in 1844 and was completed in 1869. That building was destroyed by fire in 1884. The existing church was built from Bermuda limestone between 1886-1905. Ocean Discovery Center is designed to amaze, excite and inform every visitor. You will leave with a new understanding and appreciation of the world’s oceans, their beauty and power, their diversity in plant and animal life and their importance to the very survival of our planet. Most of Cooper's Island is owned by the Bermuda Government and is preserved as the Cooper's Island Nature Reserve, which has been under active restoration since 2009. Swimming, walking, picnicking, bird watching and snorkeling are all permitted within the reserve. Warwick Long Bayis a very large beach. It's less popular than the other large beaches due to its relatively steep sand slope, and strong undercurrent. Located in Warwick Parish. Pristine, picture postcard settings. They are made up of small and medium sized sandy inlets. Located in Warwick Parish. Located in St. David's near the eastern end of the airport runway, Situated on former US Air Base lands used for NASA tracking station at Cooper's Island. Rest rooms, food concession and bar. Children's playground. Lifeguards during the summer months. The Bermuda Aquarium, Museum and Zoo (BAMZ) is located at 40 North Shore Road in Flatts Village, which is near the geographic center of the Island. The Aquarium showcases more than 200 species of fish and delicate marine invertebrates from the shallow coastal waters of Bermuda, spectacular northern coral reefs, and the deep ocean. The spectacular 140,000-gallon North Rock Exhibit showcases live corals and large predatory fish, including sharks and a black grouper. Exhibits housing marine turtles—some of them rescued after injury—and harbor seals are two other very popular areas and provide for captive management and research initiatives. The zoo displays over 300 birds, reptiles and mammals from oceanic islands in lush, naturalistic exhibits with coastal walkaways and beautiful water vistas. Located between the Aquarium & Zoo, the museum contains interactive and audio-visual exhibits that provide an insight into Bermuda's geological formation, its habitats and the impact of human life on a small island environment.